On my first Saturday in Tokyo, my friend James and his son Jasper Shun (shown here facing off in a vicious martial arts deathmatch, probably courtesy of Jasper's favorite TV character Kamen Rider) took me down to Kamakura, a seaside town south of Tokyo. Of course, we took an excellent train connection from Tokyo station. I guess James won the match. 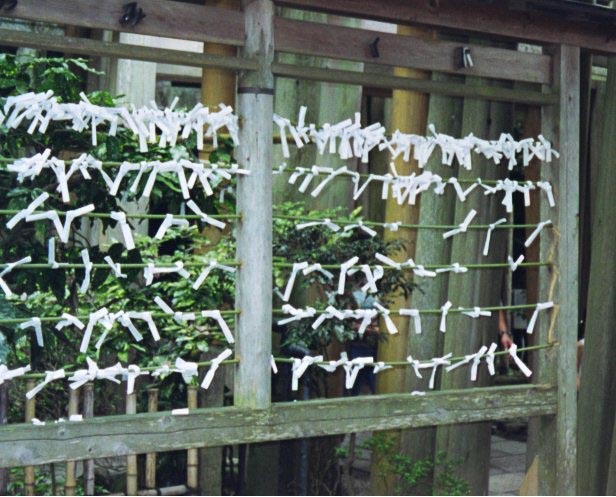 We proceeded to wash our money at the traditional money-washing shrine zeniarai benten jinja (I kid you not). Jasper showed us how - you dip water out with the dipper and pour it over. Of course, after you wash your money (your coins, natch) you throw a couple of them into the water as an offering. We then paid the small entrance fee for what everybody really comes to Kamakura for -- the Daibutsu ("big buddha"). 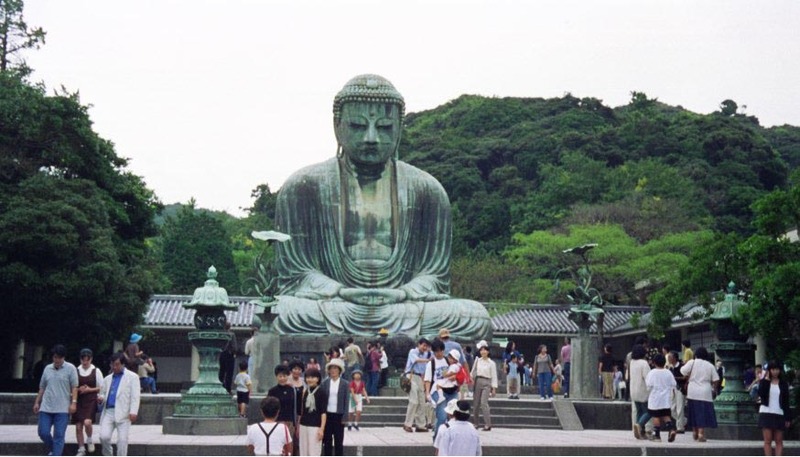 The Daibutsu is totally amazing -- a truly huge bronze statue of Buddha erected in 1252. 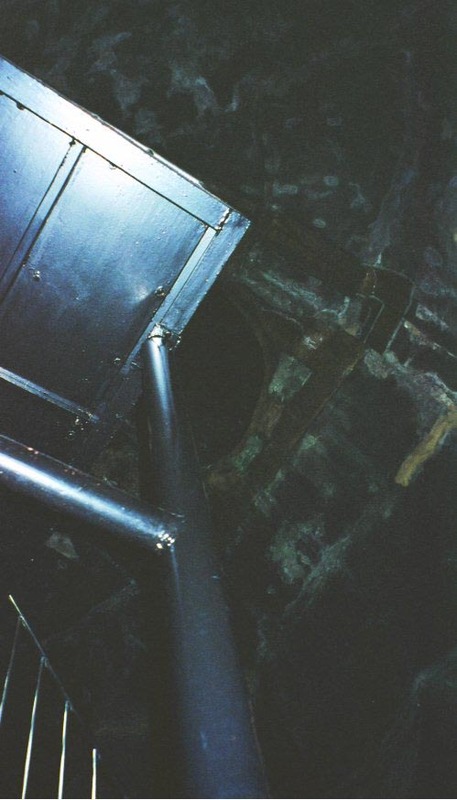 In 1252, that had to be a lot of bronze (the statue is estimated to weigh 90 tons; it's 35 feet tall and about 85 meters across at the base). The even more amazing fact is that the statue sat in a huge wooden temple until 1494, when a huge tsunami swept over Kamakura (the Daibutsu is not especially low or close to the shore, although Kamakura is a coastal town) and washed the temple away around it. The statue remained unperturbed -- now that's the kind of even that'll help get some legends started. We all mugged for pictures with the big guy. That's James' wife Kimi. For a small additional charge (have you got the pattern yet?) you can go inside the Daibutsu. This is totally worth the ¥100 and crowding, though -- it's cool to see how they built such a thing in 1252 (and repaired and reinforced it since!). OK, at this point I was beginning to get an appreciation for why sometimes there seems to be an association between Buddhist priests and greed in Japanese books. Personally, I'm from America, so I prefer the word enterprising to the word greedy, but I have to admit there were a lot of cost-exgtra things for sale at all the temples I went to. Anyway, for another ¥150 or so, you can play the stick fortune-telling game. You hand over your change and the priest hands you a cylindrical wooden box with a small hole in one end. You shake it until a stick comes out of the hole. You then hand it back to the priest, who looks at the number on your stick and hands you a sheet of paper with your fortune. Fortunes come in three basic categories, "Big Luck," "A Little Luck," and "It's OK" (as in, "it's OK, try again next time"). The fortunes all have their prognostications for various areas (business, travel, love, etc.) printed on the sheet of paper. 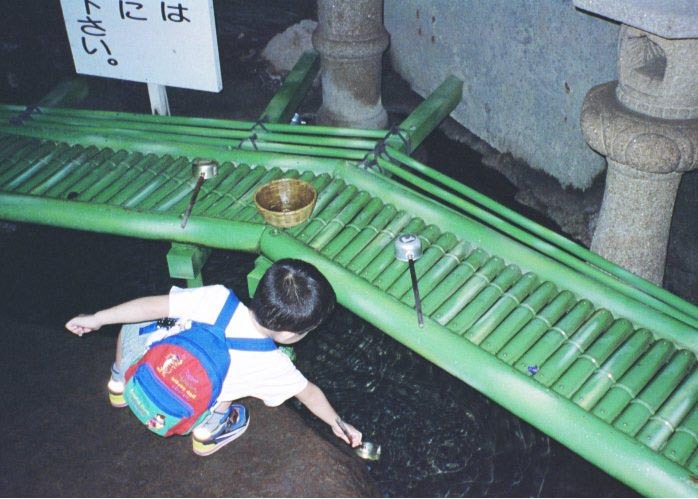 Unless you were lucky enough to get "Big Luck", you twist your fortune into a rope and tie it around this bamboo rack, so as to leave behind the bad part of the fortune and have only the good leave with you.